Well, that went by quick. This was FirstTracks Marketing’s third trip to WooCommerce Conference. We can 100 percent confirm that the WooCommerce team definitely upped its game this year. This has been a busy and exciting year of growth at FirstTracks Marketing. We are closing in on our first full year as Gold WooExperts, which has definitely put us on the map as a key player in the ongoing evolution of this technology that we believe in so strongly. We were pumped by the amazing outpouring of community we experienced. WordPress and WooCommerce have always been built on community. But to really get together and discuss the state of WooCommerce and to connect with others who are building their businesses around this technology was an amazing opportunity. We all took a lot of great information away from this gathering. Protect your clients, be their family. This really resonated with me. One of the things that makes our team so special is the family-like mentality we take with all of our clients. We will do what it takes to make sure your designs and marketing programs are a success, because your success is our success. Bekka Rice’s presentation focused on the state of the WooCommerce ecosystem and what that means to both us as developers of the software and the ever-growing community of users. I snapped the picture below from her presentation notes because the statement “It might be more costly but has greater value” really stood out to me. All too often we see people reaching out but not really understanding the true value of what these systems can provide when done right. But at the end of the day it’s up to all of us as the providers of these solutions to do a better job explaining and illustrating that value all along the way to change those perceptions. My favorite talk of the entire conference was from Zach Stepek. He presented some very exciting case study demos to demonstrate just how fast you can make WooCommerce. A lot of this is going to be possible with the recent CRUD enhancements made to the WooCommerce architecture just released in version 3.0. Zach showed how new call structures can and do eliminate 80% of the database load when doing query intensive activities such as product search and filtering. Our current clients will reap massive benefits from these enhancements immediately. Very exciting stuff. One more thought from Zach’s presentation. Something that we preach regularly to all of our clients is that speed is everything in e-commerce. If you can serve your products to your customers quicker you will sell more. It’s that simple. That all starts with a well-built theme to power your WooCommerce shop. Then add in the technical know-how to properly leverage the improved database and call structures of WooCommerce. Then watch the orders roll in! 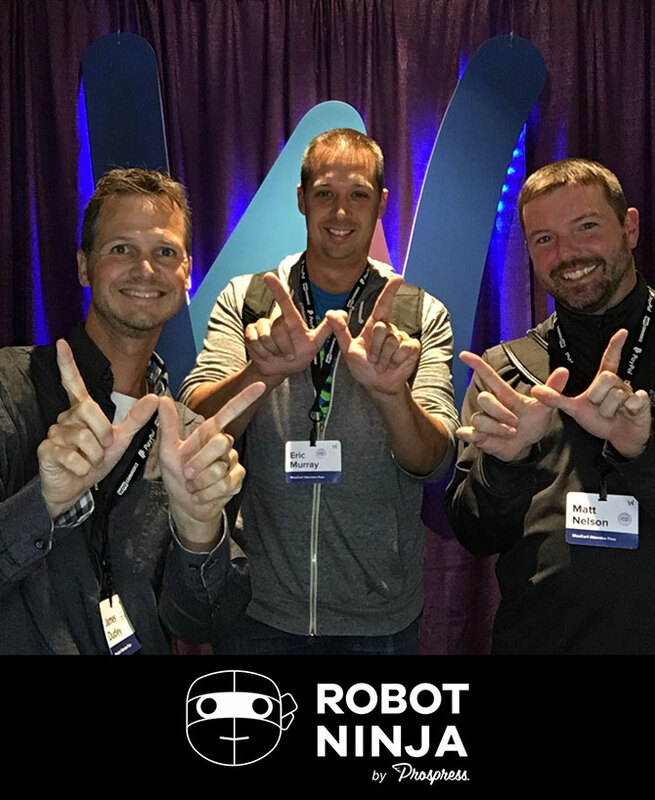 Here is a quick shot of the FirstTracks team at the end of the conference (left to right): Web Development Manager Jim Dudley, Senior Web Developer Eric Murray, and President/Partner Matt Nelson. Just giving a quick shout out to the Woo! Great trip, great people, great city, amazing content and information, great success. This event continues to become more and more important to FirstTracks as we continue to forge our path as expert WooCommerce developers. That was made more clear after seeing the kind of community that is behind the tools and technology we have chosen to focus on. How far we can all take it and where this is going is limited only by our inspiration, drive, and imagination. That’s a pretty cool place to be if you ask me. We are already implementing some of what we learned at the conference and have a lot of great new ideas and connections to push our game that much farther. We will be keeping an eye out for WooCommerce Conference 2018. Heck! You might even see us on the presenter list for next year! Stay tuned….